With the Continental Electric CE23111 Steam Iron, you can get perfectly pressed clothes all the time. This steam iron offers its Non-Stick Soleplate and adjustable temperature to guarantee smooth, trouble-free ironing. Now, you can easily glide this versatile iron over your clothes without any worries. Plus, with four different functions such as steam, dry, spray, and burst, you can easily get the wrinkles out of your clothes. 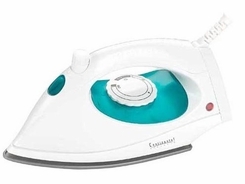 The Continental Electric CE23111 Steam Iron also comes with a Power Indicator Light and a transparent water window for your visual instruments. Get perfectly pressed clothes every time with the Continental Electric CE23111 Steam Iron!